Are Basque Terrorists Being Trained in Venezuela? 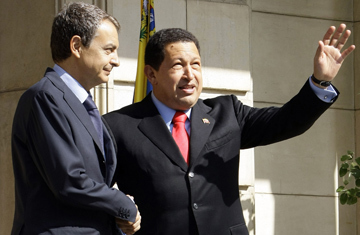 Venezuela's President Hugo Chavez (right) waves as he is greeted by Spain's Prime Minister Jose Luis Rodriguez Zapatero before their meeting at La Moncloa Palace in Madrid September 11, 2009. Is the End Near for Basque Separatist Group ETA? Spain's stormy relationship with Venezuela grew even more troubled this week, after a Spanish court on Monday released documents in which two accused members of the Basque terrorist group ETA declare that they received weapons training in the South American country. Along with issues such as trade complications and the occasional insult between leaders, a source of tension between Spain and Venezuela is the long-held rumor that the government of Venezuelan President Hugo Chávez has been providing cover for ETA in its deadly struggle for Basque independence. Now Xabier Atristain and Juan Carlos Besance, who were arrested on Sept. 29, have provided the first piece of eyewitness testimony to just such a collaboration. And, in the process, they risk provoking yet another diplomatic crisis between the two countries. In the court document, Atristain and Besance testify that they attended a training course in July and August 2008, taught in part by Arturo Cubillas Montan, who was and still is a member of Venezuela's Ministry of Agriculture. In March of this year, another Spanish judge, who was investigating the Chávez government's purported mediation between ETA and the Revolutionary Armed Forces of Colombia (FARC) issued an extradition order for Cubillas, who was born in Spain but is a naturalized Venezuelan citizen. The indictment accuses him of being ETA's leader in Venezuela, and charges that he received assistance from Venezuelan intelligence forces. As it did following Cubillas' indictment, Venezuela has forcefully denied the latest charges. "The Venezuelan government is in no way linked to any terrorist organization, especially with the Basque group ETA," said Venezuelan ambassador to Spain Isaias Rodríguez in a statement to the press on Monday. "We confirm in the strongest possible terms our condemnation of terrorism in all its forms and manifestations." Chávez was no less adamant when he called in to a national television show Monday night: "There's no doubt that with these absurd charges, these two delinquents are just trying to reduce the severity of their punishment." Yet even before Atristain and Besance made their testimonies, evidence has been building of Venezuela's collaboration with ETA. Much of the Spanish case against Cubillas rests on information found on a computer belonging to the FARC's second-in-command, Raúl Reyes, who was killed in a Colombian army bombardment in 2008. And ETA documents intercepted in France in the last few years have also suggested that, as one reporter for Spanish newspaper El País puts it, Venezuela has become a "spa" for members of the Basque organization. Some aren't so sure. Juan Carlos Monedero, professor of political science at Madrid's Cumplutense University, believes this is all part of a campaign against the Venezuelan government. "If there is evidence that crimes are being committed, [the Spanish judges] should present it, and I guarantee that the Venezuelan government, which supports the rule of law, will pursue it," he says. "But this is just about demonizing Chávez." Others, however, have no doubt that ETA is training in Venezuela. Mikel Buesa, an economics professor at Cumplutense who specializes in terrorist financing  and whose brother was killed by the group in 2000  says that ETA has a long history in Latin America. "They were in Nicaragua with the Sandinistas, and when Noriega fell, they went to Cuba," he says. "Then, when the Spanish government started putting too much pressure on Cuba, they decided to move again  and that decision coincided with Chávez 's election." Spanish investigative reporter Antonio Salas (a pseudonym) is similarly convinced. He spent several years undercover researching international terrorism, and during the time he spent in Venezuela managed to infiltrate one of the camps used for terrorist training. "It's much cheaper and easier to learn to use explosives or to fire an Uzi in Venezuela than it is in France or anyplace else in Europe," he says, referring to the fact that the French Basque country has, for decades, served as ETA's refuge from Spanish police. The testimony released on Monday puts the Spanish government in a delicate spot. For one thing, ETA members first arrived in Venezuela between 1984 and 1989, after Spain's then Prime Minister Felipe González, who belongs to the same Socialist party as current Prime Minister José Luis Rodríguez Zapatero, convinced his Venezuelan counterpart to accept the men as political refugees (this was before the organization was declared a terrorist group). Further complicating the situation is the economic arrangement between the two countries. Many Spanish companies, including telecommunications giant Telefónica  which does $3 billion of business a year  and energy conglomerate Repsol, which in 2009 discovered a deposit of roughly 1 billion barrels of oil off of Venezuela's cost, have invested heavily in the South American country. During diplomatic dust-ups in the past, Chávez has threatened to nationalize Spanish banks in Venezuela and cut all official ties with Spain. Spain and Venezuela's relationship plunged into crisis in 2007, when Chávez publicly criticized the former Spanish Prime Minister Jose María Aznar  calling him a "fascist"  at the closing session of the Ibero-American summit. Spain's King Juan Carlos, who was also attending the event, interrupted Chávez's diatribe to ask: "Would you please shut up?"  a phrase that has gone down in the annals of diplomatic history. For the moment, the Zapatero government is proceeding cautiously. After Foreign Minister Miguel Angel Moratinos demanded a response from the Venezuelan government on Monday, Deputy Prime Minister María Teresa Fernández de la Vega told parliament on Tuesday that she considered the South American country to be cooperating. Later that day, however, the Venezuelan ambassador gave a press conference in which he suggested that the incriminating testimony may have been forced. "Even though we're aware that torture should not occur in these case," Rodríguez said, "Venezuela has serious doubts that these declarations, no matter how false and malicious, were totally voluntary." Diplomatically speaking, accusing another country of torture is just as provocative as accusing it of terrorism, and sure enough, the situation has already escalated further. On Tuesday afternoon, Spain's opposition Popular Party demanded that the Venezuelan ambassador be called in to explain himself. It's a situation that promises to get worse before it gets better.